Last year the kids and I came up with three great Father's Day ideas. My husband was blown away with the creativity and loved the gifts. I thought I would keep today's post short and give you the links to last year's ideas. Idea #1 - Father's Day Questionnaire - This was so much fun. I gave each child the questionnaire to fill out. My husband adored their individual responses. 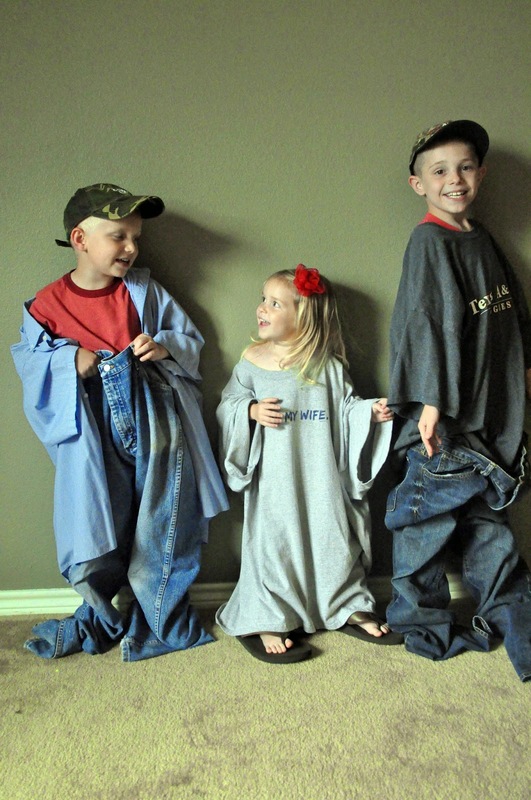 Idea #2 - Father's Day Pictures - I dressed the kids up in some of my husband's clothes and then took a ton of pictures. The pictures are absolutely priceless. Father's Day Pictures - Click the link to view the original post. Idea #3 - Father's Day Posters - Using the pictures in the above link, I covered large pieces of canvas to hang in our loft. *If you go with this idea I would suggest using foam board instead of canvas. The canvas has not held up well. Father's Day Pictures Part 2 - Click the link to view the original post. Mommy...He's Breathing and It's Bothering Me!